UPDATE: The official release has been incorporated in the CM6, which is now faster than it has even been. I've reverted back to CM6 and flashed a new nightly. Keep an eye on this post, as I'll be updating as I use this ROM. It comes with Launcher 2, but I plan to replace that with ADW pushed to /system. It also has no support for the Japanese locale, so I am going to be working on adding that as well. Depending on performance, I may flash swapscript 2.1. As I was about to post this, I just found out that many of the new features are already in the CM6 nightly builds, which can be found here for the ht-03a. 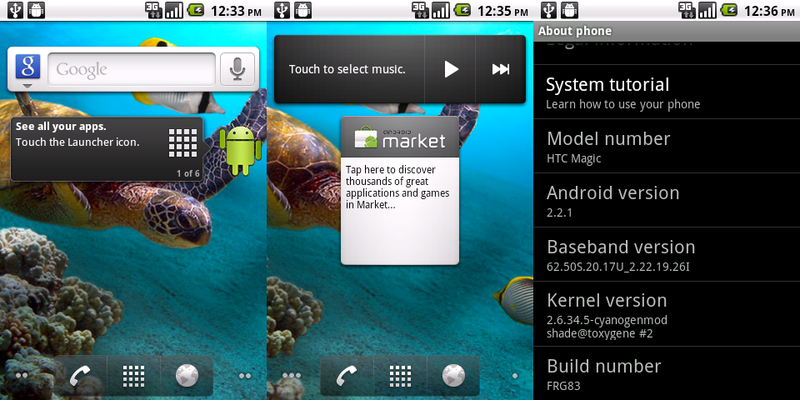 Here is the first ROM based off CM6 and the T-Mobile official Froyo update to the My Touch 3G, which is the same phone as Docomo's ht-03a. A full wipe of the phone is required first. Do a nandroid backup first! I'd also suggest using Titanium Backup to backup your user applications to save the hassle of having to download them again. Both Simeji and ADW launcher have options to save your settings to the SD card, which is good to do so that you can quickly restore. The first step for anyone who has an engineering SPL is to erase /system /data and /cache with fastboot. (This will not work for anyone who used Universal Androot on the ht-03a. Those people should flash the zip in main post to erase. This can also be done by booting into recovery, but does not always result in a full wipe and is therefore not the preferred method). Next, flash the zip from recovery and reboot. Go to Settings/Wireless Networks/Mobile Networks and deselect roaming if it is on - don't think this will matter in Japan, though. So far, it does seem quite speedy, though for me, it is not amazingly fast compared to CM6. I think the people who are absolutely freaking out about that, for whatever reason, had an exceptionally slow experience with CM6. I'll update below as I use this more. How do you update if you are already running CM6? Just use the ROM Manager and update from the sd card? 1) backup, 2) wipe/factory reset, and wipe caches. 3) Then flash zip. That is all. Or, if you want to try the newest CM6 nightly with this stuff already in it, you don't have to wipe at all, just flash the zip directly on top of your current system. Once you flash a few ROMs, you'll get the hang of it - pretty simple. Whenever going between different ROMs, you must wipe for best results. If you are going from CM4 to CM5 or CM5 to CM6, you must wipe as well. If you are going from CM 6.0 to CM 6.1 (not yet released), then no need to wipe. Sweet do you have a link to where I get the latest nightly? Added link to discussion on XDA to post. Actually I just payed for the premium ROM manager I figured it was easier. CM6 now based off the official T-Mo Froyo and is fast. very fast.